There wasn’t much in my lunch bag for breakfast this morning. A single banana. One, lonely, banana. When I came to work, I remembered that I had a jar of crunchy peanut butter at my desk and soy milk in the refrigerator. Smoothie time! 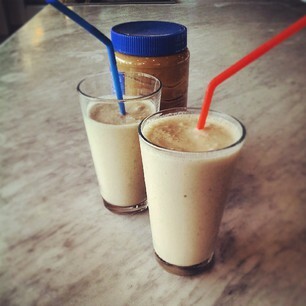 This Banana Peanut Butter Soy Smoothie was a healthy, satisfying and delicious combination of flavors and quick to make. I suggest you make it for breakfast tomorrow! 1. Blend all ingredients together until smooth. Drink up!